So I live in an apartment complex with 7 building in a U shape. There are 2 small parking lots in the front near the top of the U and a large parking lot behind the set of complexes and down a flight of stairs. My apartment is on the ground floor near the front parking lots. However, those lots only hold 9 cars. Everyday is a new battle for one of those spots. I aim to park in front because if I have to see the lot, my car should be there right. And if I have groceries or something to bring in, I want a close spot. In general, I park in my preferred lot but lately it's been full (curses) and I have to park in the back. I just get annoyed the time to get a spot fluctuates lately, if I am not home by 6 pm I have to park in the back. 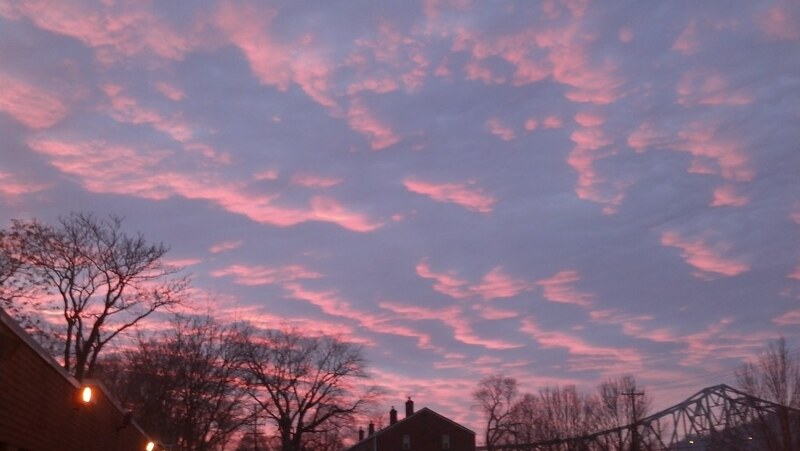 How gorgeous is this sky? Anyway, this has resulted in not taking my suitcase in from my California trip. I finally caved this morning and before I got a shower, went to my car to move it out front to drag my suitcase in. This picture was from my walk to my car. So enough whining and onto the yarny goodness. The socks from last WIP Wednesday have gone back into hibernation because I messed up the pattern. The debate is on whether to just keep going or to rip back and fix. I am leaning toward just finishing them though so we will see. I did get some work done on my Hue Shift Afghan but don't have a picture of the progress. I should have one next week though. I did however start a very special project. 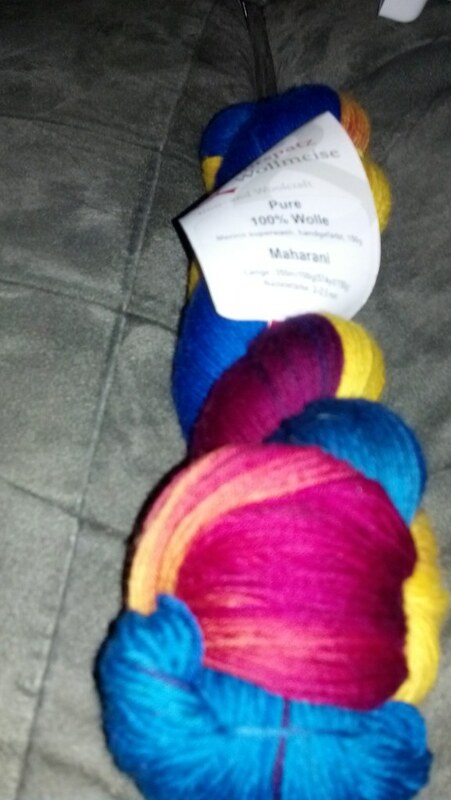 My friend Dianne went to Germany with her family and made a trip to the Wollmeise Yarn Store. She brought me back 1 skein that I gave her money for and 1 skein as a Christmas gift. Honestly I could not wait to crack into the thing and started the Trillian shawl. So I wound the yarn and started the shawl. 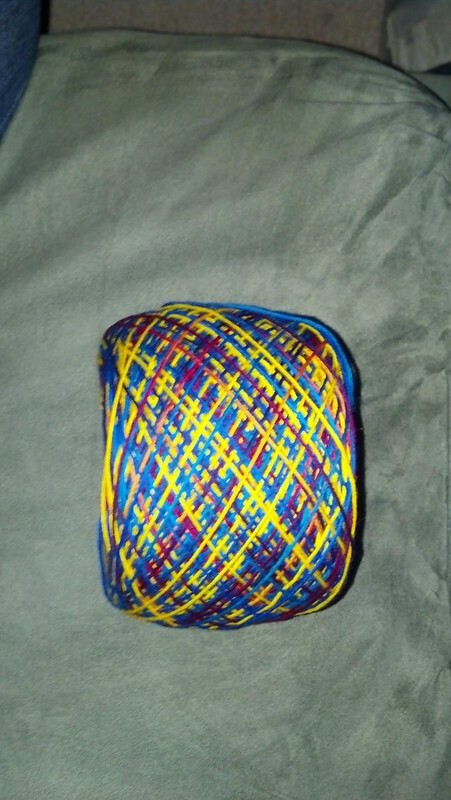 I thought the yarn looked like sunshine and stars so hense the name "Sun and Stars Trillian". I am in love with the pattern. It's super easy but has such a lovely look and the drape is already awesome. Honestly, this shawl continues to make make smile as I look at the colors and what more could you ask of your yarn and project. Well, that's it for this week. Class started last night and I feel as though this one will be interesting but intense so stay tuned for the updates. Glad to know someone else feels my pain. There are days when I want to write a passive aggressive note but know it won't do any good. It's beautiful :) I can understand why it makes you smile. 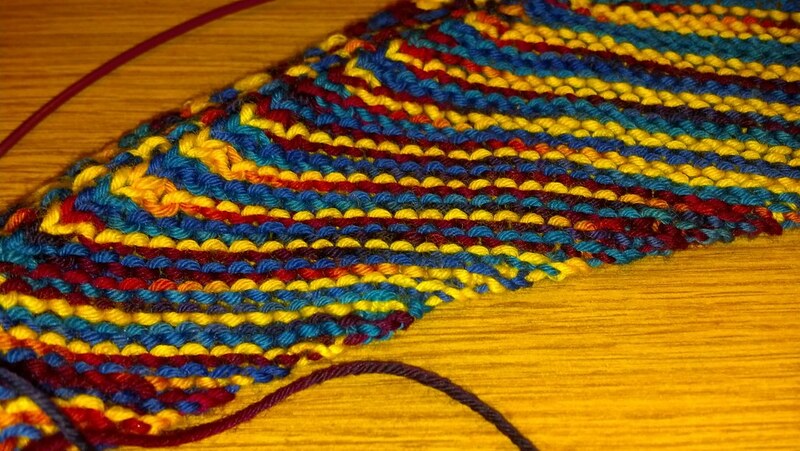 I always love seeing how a variegated skein first winds into a cake and then knits up - keeps things interesting! Yeah me too. I love this yarn! I am pretty jealous of the proximity but too bad it was only when you were little.